The SCALE project aims to allow the extraction of Scandium (Sc) from bauxite residues resulting from alumina production (the raw material for primary aluminium production) and from acid wastes coming from titanium dioxide (TiO2) pigment production. 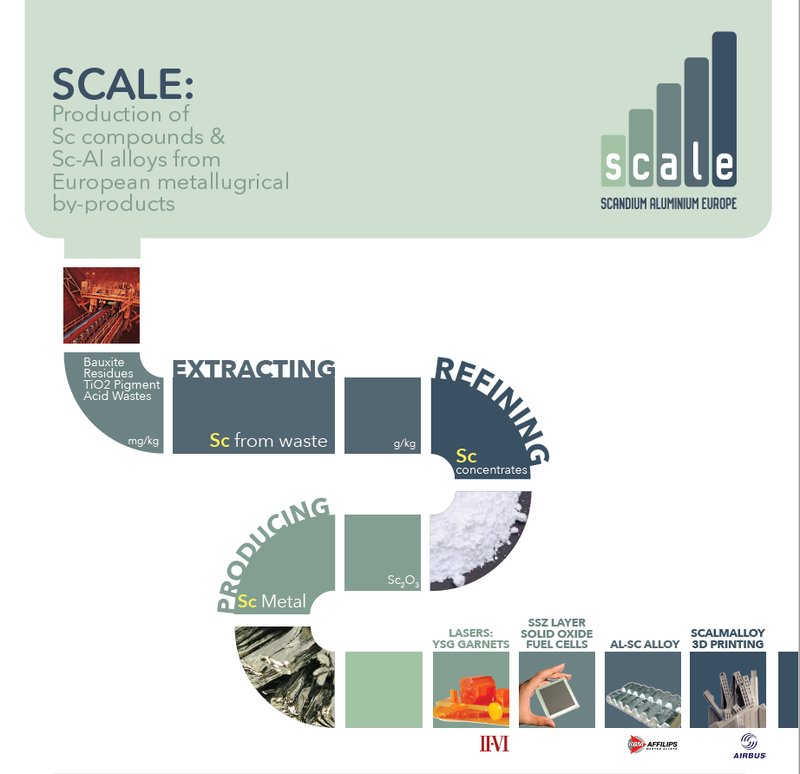 SCALE develops innovative technologies that can extract economically and sustainably Sc from dilute mediums (<100 mg/L) and upgrade them to pure oxides, metals and alloys at lower energy or material cost. This will be achieved through the development of a number of innovative extraction, separation, refining and alloying technologies that will be validated in an appropriate laboratory and industrial environment to prove their technical and economic feasibility. The SCALE project has received funding from the European Community’s Horizon 2020 Programme (H2020/2014-2020) under grant agreement n° 730105. Scandium is a rare-earth metal, used in small amounts but with drastic effects on properties of matter. It is a key component in producing high strength Aluminium alloys used in aerospace and 3D printing as well as in Solid Oxide Fuel Cell (SOFC) applications. Yet Scandium supply is limited due its scarcity and the high cost of its production, which currently takes place in Asia and Russia. Europe has no production of Scandium, but is home to many Scandium end-users and to industries having Scandium in their industrial residues. By converting waste into resources and thus developing a stable and secure EU scandium supply chain to serve the needs of EU aerospace and high tech industry, the project will contribute to reduce dependency on imports of raw materials. Beyond industrial symbiosis, the SCALE project further contributes to a sustainable economy through the use of scandium-containing products. Scandium-containing SOFC have a better efficiency in electrical conversion when compared to thermo-electrical plants (60% instead or 30%; i.e. for 1 kg of natural gas produced, the SOFC can produce about 8 kWh of electrical energy, instead of 4) and reduce respectively CO2 emissions. Al-Sc alloys can bring about weight reduction in commercial aircraft construction enabling fuel saving, greatly improving the environmental footprint of each flight as well as its cost (each kg less resulting in 800-1000 gallons of fuel saving over the entire lifetime of the aircraft). By applying the 3D-printing technology in manufacturing commercial aircrafts, weight reduction could reach even higher percentages. Similar crucial weight reduction advantages can be expected from the application of Al-Sc alloys in the production of electric vehicles. Extracting scandium from low-grade resources like Bauxite Residue and TiO2 acid waste is technically complicated due to the nature of these resources. In both by-products, the high iron concentration complicates the conventional extraction techniques to the point where the process becomes un-economical. Production of scandium metal and alloy is achieved only through calciothermic reduction, which is a very expensive and small-scale technology, thus resulting in very expensive and limited metallic scandium products. SCALE develops breakthrough technologies to overcome both extraction and metal production barriers, as well as optimizes refining technologies to reduce processing costs and remove use of harmful reagents like HF gas. Economically, the ‘mass’ scale expansion of the scandium and especially the Al-Sc market depends largely on the price of the alloy. Current prices can only be ‘afforded’ by the aerospace and aeronautical industry. SCALE operates under the basic economic assumption that through extended supply and lower processing costs Scandium prices can be reduced, enabling larger market development. However, currently scandium oxide (and metal) is not traded on a metals exchange, and there are no terminal or futures markets where buyers and sellers can fix an official price. Once Sc becomes a globally traded commodity in stock markets (like the other Rare Earth Elements), its price will be effected by numerous other economic and political factors. STIFTELSEN SINTEF, IOLITEC, KBM AFFILIPS MASTER ALLOYS, Less Common Metals, TRONOX Pigments, Aluminium OxidStade GmbH, ITRB, KURT SALMON LUXEMBOURG S.A.